If you’ve been thinking about pulling the trigger on a faster broadband connection, then a new offer from Sky might just persuade you to do so, with the firm cutting 10% off the price of its Fibre Max package. This gives you an FTTC (fibre-to-the-cabinet) connection with a promised average download speed of 63Mbps (and 18Mbps upload), boasting unlimited usage. That £27 monthly fee includes your line rental and Sky Talk, plus other bonuses like nuisance call blocking, parental controls, and a MasterCard with £50 prepaid on it. 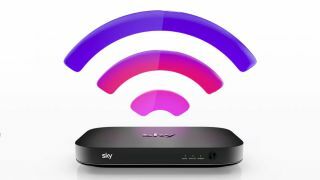 You also get a Sky Q Hub (pictured) for your wireless router. After the 18 months are up, the price of the package reverts to £43.99 per month. Sky also gives Fibre Max users a ‘speed guarantee’ whereby if your speed drops below a specified ‘minimum access line speed’ within the first 30 days of use – as judged using Sky’s own speed checker – you can claim your money back. Fibre Max was already a solid package, so it’s good to see a further 10% come off the asking price. As ISPreview, which spotted this, notes, Sky has also ditched its standard FTTC package (Sky Fibre Unlimited) which offers 36Mbps average downloads. Apparently letters are being sent out to existing Sky Fibre Unlimited customers telling them that they will be upgraded to the Fibre Max plan free of charge, which is good to hear. Meanwhile, get yourself ready for Black Friday in November, where the usual host of bargains will be on offer, doubtless including some beefy broadband discounts for those who want to bide their time for a bit longer.